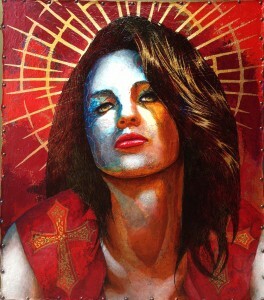 Master artist to the stars, George Yepes will unveil his latest work at Corazon de Los Angeles, historic Olvera Street’s newest gallery on Saturday, June 27, 6:00 – 9:00 p.m. The aptly named gallery is located in the heart of Los Angeles, at El Pueblo Historical Monument in Downtown Los Angeles, the city of L.A.’s birthplace. Corazon de Los Angeles is celebrating it’s third anniversary with new works by the world renown Chicano artist who grew up in East Los Angeles and was a significant contributor to Los Angeles’ most iconic murals and the growth of Chicano art to popularity and acclaim beyond Los Angeles. Yepes’ paintings are in the personal art collections of Hollywood’s most cutting edge actors and filmmakers including Sean Penn, Madonna, Patricia Arquette, Nicolas Cage, Cheech Marin, Anthony Keidis of the Red Hot Chili Peppers, Quentin Tarantino, and Robert Rodriguez. “George’s work grabs you by the lapels and makes you feel as if you’re discovering art for the first time. He’s a master painter in the best sense, the art comes through him not from him. That is rare,” Director Robert Rodriguez said. 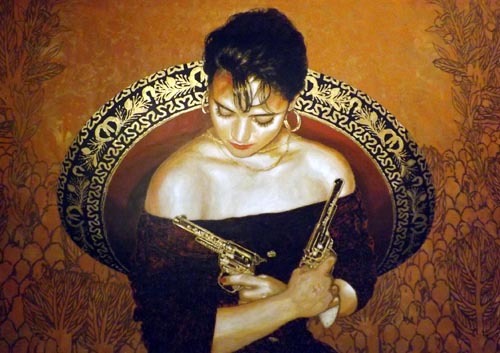 Joining Yepes in the exhibit – which runs through July 19 – are several former students of his art academy, the Academia de Arte Yepes at Academia de Artes Yepes : Juan Solis, Maria Kane, Gene Ortega, Saul Aguilera, Ricardo Estrada and Ulie Garcia, Ben Morales – all now accomplished artists in their own right. Meet the artists and enjoy some light refreshments, music. Free admission. Corazon LA is located at W-19A (2nd level above La Golondrina Restaurant)) on the historical Olvera Street marketplace. (634 N. Main St.) L.A.
For more information, email info@corazonla.com, call (213) 617-0227 or visit on facebook: Corazon de Los Angeles’s Corazon de Los Angeles’ Facebook page.